Planetarium at the Smithsonian in Washington, D.C.
Einstein Planetarium at the Smithsonian in Washington, D.C. When traveling through Washington, D.C., the monuments and history alone can monopolize your time. All that sightseeing can take a giant toll on your feet. The Smithsonian, much like the Louvre in Paris, is something you shouldn't miss even if you have only one day in town. Your best bet for pacing out your day is to find a place to sit every once and a while. And, if you can soak in the science, history, and culture of the District while doing it, you have won. A brilliant option is the Albert Einstein Planetarium. The planetarium is one of the many highlights of the Smithsonian National Air and Space Museum. 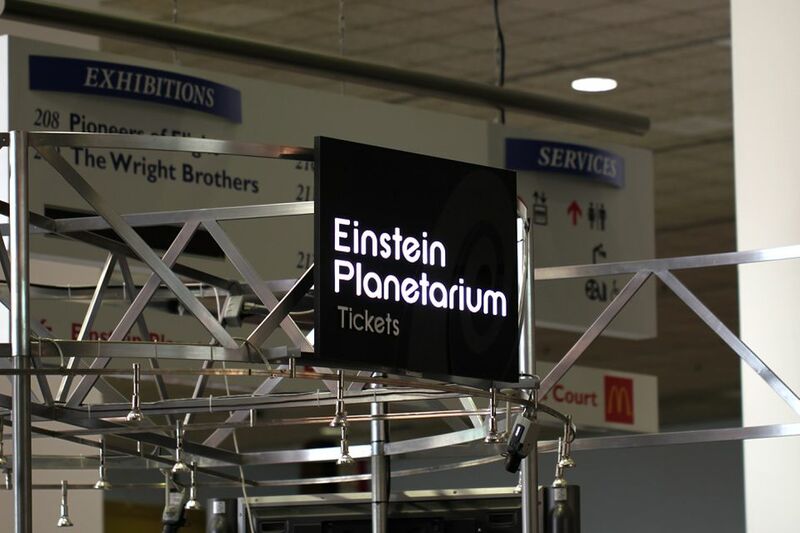 All you need to do is pick a seat in one of the 233 seats in the completely revamped Albert Einstein Planetarium on the second floor of the National Mall building and look up. In 2014, a new ultra-high quality Full Dome Digital System was installed in the planetarium. The projection system is 16 times the resolution of HD, providing an exceptional level of detail, clarity, contrast, brightness, and color saturation. The renovation also featured a new state-of-the-art, immersive digital sound system. The Definiti projection system is a workhorse, playing at least 17 shows in the planetarium each day. The new projectors get so hot that there’s a small corridor built just behind the theater walls to keep the air cool and circulated. The planetarium was closed to the public for about two weeks when it got its biggest upgrade since the theater went digital in 2002. Carpeting and seats, which had been in use since the museum opened in 1976, were ripped out and replaced. The planetarium is a great idea for a sweltering summer day, snow day or day of rain and misery outdoors. Most shows are geared for all ages. You can bring your stroller inside the theater. Parents recommend sitting in the back rows for the best views. The daily show is usually a journey through time and space showing the night sky in Washington, D.C. The show is usually curated live and lasts less than a half hour. Returning museum guests from prior to 2014 will certainly notice a difference from the lo-fi of the past to the current projection system when going to see a show like "Dark Universe." As galaxies form in the beginning of the universe, they become a subtle black and gray web of stars that benefits greatly from the projector’s sharp contrast. While narrator Neil deGrasse Tyson describes the way light waves stretch as they travel through the universe, the dome seems to seize up as the redshifted beams pull the sky apart. "To Space & Back" is another show that showcases the myriad technologies astronomers and astronauts use to explore the universe, and how those engineering marvels are adapted to benefit life on earth. One invention, a laser developed to study earth’s atmosphere, is now used in surgery to clear blocked arteries. If you buy a ticket for the planetarium, for a reduced fee you may also see an IMAX movie with the combination ticket discount.